The Cisco Virtual Wireless LAN Controller (vWLC) is available with two types of software images: small scale image (supports up to 200 access points and 6000 clients) and large scale image (supports up to 3000 access points and 32000 clients). The Virtual Controller supports secure guest access, rogue detection for Payment Card Industry (PCI) compliance, and in-branch (locally switched) Wi-Fi voice and video. The Cisco Virtual Wireless Controller provides centralized control, management, and troubleshooting. It supports the Cisco FlexConnect™ solution. Data traffic from the access points are switched locally at the access point. The Cisco Virtual Wireless Controller automates wireless configuration and management functions and allows network managers to have the visibility and control needed to cost-effectively manage, secure, and optimize the performance of their wireless networks. Cisco Virtual Wireless Controller in central switched mode supports Bonjour Services Directory to enable Bonjour Services to be advertised and utilized in a separate L3 network. Wireless Policy engine is a wireless profiler and policy feature on the wireless controller that enables profiling of wireless devices and enforcement of policies such as VLAN assignment, quality of service (QoS), ACL and time-of-day-based access. As a component of the Cisco Digital Network Architecture (DNA), this controller provides real-time communications between Cisco Aironet® access points, the Cisco Prime Infrastructure, and the Cisco Mobility Services Engine, and is interoperable with other Cisco controllers. With integrated Cisco CleanAir® technology, the Cisco Virtual Wireless Controller provides the industry’s only self-healing and self-optimizing wireless network for small and mid-sized businesses as well as large enterprises. 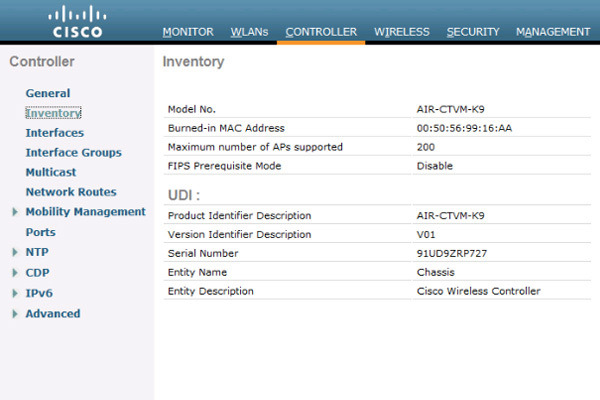 Download the Cisco Virtual Wireless Controller Datasheet (PDF).